Guy Duhaime began his career in finance as a shareholder of Restaurant Pépé. Over the course of the past 34 years, he has become an established financial planner who has served in various executive positions. Currently, Mr. Duhaime utilizes his skills and knowledge to assist Groupe Financier Multi Courtage in achieving its goals. An expert in complicated corporation situations and life and disability insurance brokering, he is responsible for managing overall operations, including strategic marketing, wealth management, retirement planning and new business development. 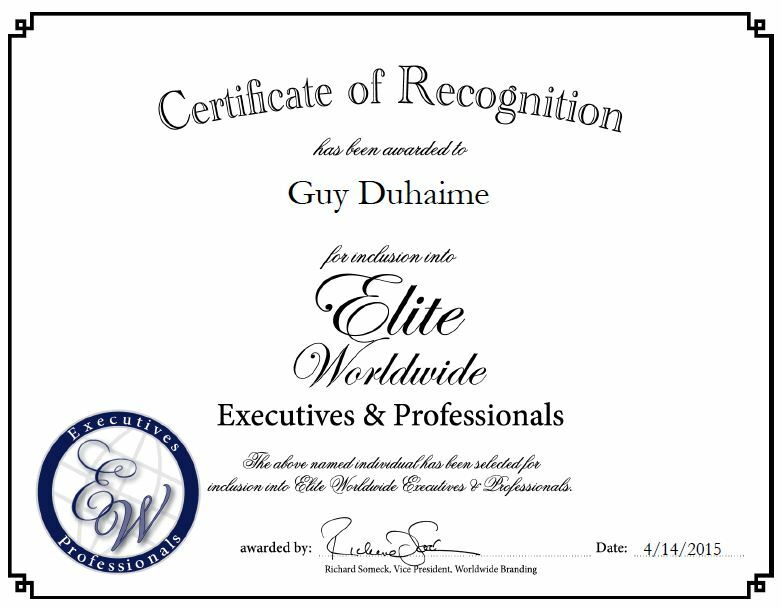 Mr. Duhaime attributes his success to his experience, business relationships and team management skills. Looking toward the future, he plans to expand the company’s services and recruit new agents. Outside of his professional endeavors, Mr. Duhaime sponsored shows for semi-professional people in the industry. He also volunteered with the Montreal Symphony and organizations that help children and cancer patients.